Life cycle: This insect produces one generation each year and the adults hibernate in protected areas. Eggs are deposited in young apples, and the larvae that hatch mature within and drops to the ground in June. 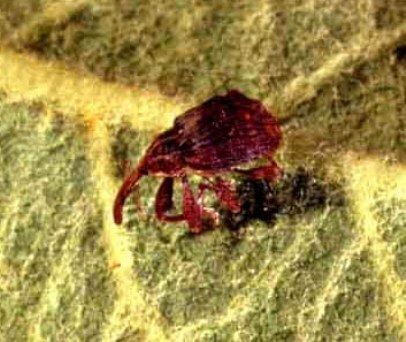 Physical Description: This curculio is very similar to the Plum Curculio, is brownish red, 1/10 inch long, and is humped with a long snout. The eggs are laid in the young apple in punctures, which are close together. The larva is a gray or white and is very worm-like. Controls: Since the larva stay in the apples that drop for a short time prior to boring into the ground, you can disturb their life cycle by picking up the dropped apples and disposing of them in the trash or burying them in your compost pile. You can also shake branches, or hit them with a padded board, to knock them from the tree, and collect them on a sheet or tarp. They like to play possum when frightened.